Aims and Objectives : Anemia of chronic disease (ACD) is one of the most common forms of anemia. It is defined as anemia occurring in chronic infections, inflammatory conditions or neoplastic disorders which are not due to marrow deficiencies or other diseases, and occurring despite the presence of adequate iron stores and vitamins. Periodontitis is one of the most prevalent chronic inflammatory diseases in humans. This study aimed at finding out if periodontitis, like other inflammatory conditions, could lead to anemia. Materials and Methods : Thirty chronic generalized periodontitis male patients with hemoglobin levels below 15 mg/dl and serum ferritin values above 30 ng/ml were selected. The various blood parameters recorded at baseline were hemoglobin levels(Hb), erythrocyte count (RBC), erythrocyte sedimentation rate (ESR), mean corpuscular volume(MCV), mean corpuscular hemoglobin (MCH) and mean corpuscular hemoglobin concentration (MCHC). Periodontal parameters recorded at baseline included: plaque index, gingival index, probing pocket depth, clinical attachment level. Periodontal treatment including surgery if required was carried out in all the patients. Periodontal status of patients was monitored by repeating evaluation of periodontal indices at three months and at the end of one year. The hematological values were again measured at the end of one year. Results: The results showed that correction of periodontal inflammation resulted in a significant increase in hemoglobin levels and erythrocyte counts. The erythrocyte sedimentation rate showed a reduction indicating resolution of periodontal inflammation. There was a significant, but much lesser, improvement in MCV, MCH and MCHC values. Conclusion: The results of this study showed that treatment of periodontitis leads to an improvement in hematocrit and other related blood parameters in chronic generalized periodontitis patients with anemia. This provides evidence that periodontitis like other chronic diseases may also cause anemia. Recently, Hutter  have concluded that periodontitis, like other chronic conditions, lead to anemia. Other studies has failed to prove this relationship. The present interventional study was carried out to evaluate periodontitis as one of the etiological factors leading to ACD. Thirty male patients, aged between 30-55 years, with chronic generalized periodontitis were selected for the study. Patients chosen for the study had at least 30% or more of the teeth having greater than or equal to 4 mm probing depth and their hemoglobin levels were less than or equal to 15 mg/dl. Patients with systemic diseases; present and past smokers, patients who have undergone periodontal treatment six months prior to the study or who have less than 16 remaining teeth in the mouth were excluded from the study. Patients were included in the study only after they were explained the elected procedure in detail and gave their consent. The various hematological and clinical parameters were assessed at baseline. Under aseptic conditions, venous blood was drawn from ante-cubital fossa and sent for the following investigations [Figure 1]. Serum Ferritin was estimated at ANAND diagnostic laboratory, Bangalore. (NABL 15189 Accredited). Only patients with Serum ferritin above 30 ng/ml as well as hemoglobin values 15 mg/ dl were included in the study. An inclusion of patients with serum ferritin value above 30 ng/ml was done to exclude patients with pure iron deficiency anemia [Figure 2]. Plaque index according to Silness and Loe (1964). Gingival index according to Loe and Silness (1963). Probing pocket depth (Community Periodontal Index using CPITN probe). Clinical attachment level (Community Periodontal Index using CPITN probe). Full mouth scaling and root planing was carried out. Patients were not put on any iron or vitamin supplements. Neither was there any modification in the diet. After three months, periodontal indices were repeated. The CPI index was used in this study as it helped to decide the further treatment plan of the patient after three months [Figure 6]. All patients were put on maintenance phase. The periodontal indices and blood samples were again collected at the end of one year [Figure 7]. The collected data was subjected to statistical analysis through SPSS (Statistical Presentation System Software) for windows (version 10.0). The statistical methods applied were Paired sample't' test, Repeated Measure ANOVA and Descriptive statistics. The paired Sample't' test procedure was used to compare the means of two variables. Repeated Measures procedure provides analysis of variance and was used for the values got for clinical parameters. The results were presented in text, tables and graphs. Statistical evaluation of clinical and hematological parameters yielded the following results [Graphs 1-4]. [Additional file 1], [Additional file 2], [Additional file 3], [Additional file 4] Both [Table 1] and [Table 2] show the mean and standard deviation of plaque scores at baseline, three months and at the end of one year. A statistically highly significant decrease from baseline to three months and a slight decrease from three months to one year were seen. [Table 3] and [Table 4] show the mean and standard deviation of calculus scores at baseline, three months and end of one year. A statistically highly significant change was observed from baseline to three months and slight change from three months to one year. F value was found to be significant at 0.000 levels. In [Table 9], results for the overall data analyses for hematological parameters are presented. The hemoglobin, erythrocyte count and hematocrit values were significantly increased post treatment at the end of one year (p less than 0.000). 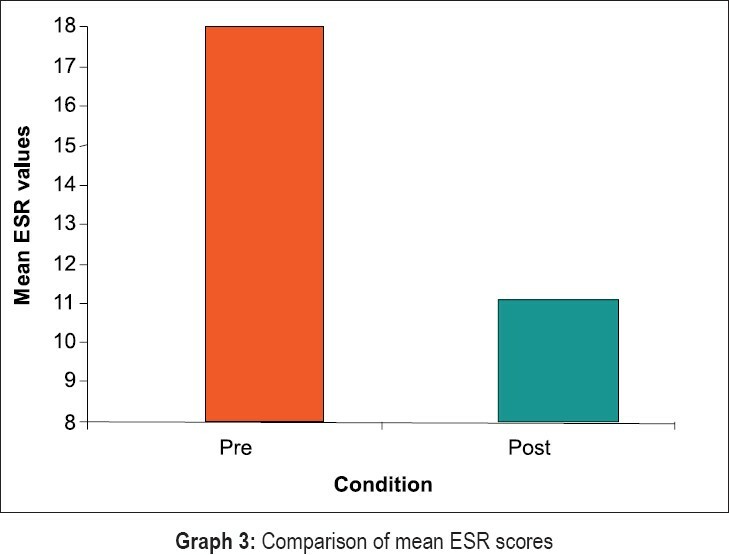 Further, the ESR values were higher at the end of one year (p less than 0.000). 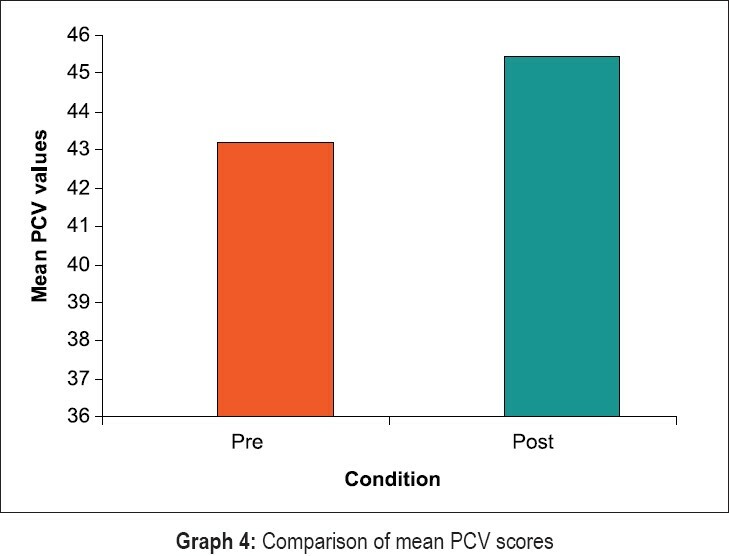 The increase in values of MCV, MCH and MCHC post treatment in our study was not very high. 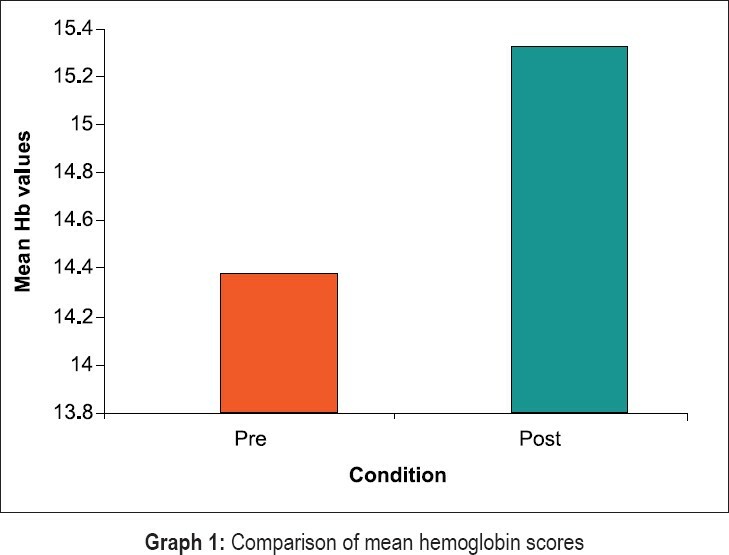 The overall results of hematological parameters as shown in [Table 9] are represented by bar graphs. The present interventional study was carried out to measure the effect of periodontal therapy on hemoglobin and erythrocyte levels in chronic generalized periodontitis patients with anemia. The relation between anemia and periodontitis has been explored in the latter half of 20 th century. The studies investigated both the concept of anemia as an etiological factor of periodontitis and periodontitis as a risk factor of anemia. It was hinted and believed that anemia may be a factor in the causation of periodontitis rather than a consequence. Chawala  suggested anemia as an important factor in the causation or pathogenesis of periodontal disease. Lainson also put forward anemia as a systemic cause of periodontitis. In 1935, the concept that the depression in the number of erythrocytes is apparently secondary to the presence of periodontal disease was first put forward clearly by Epstein. He reached to this conclusion as arrest or cure of chronic periodontal disease in his patients resulted in the elevation of the erythrocyte count to normal or high normal levels. , Siegel  reported a depression in the number of erythrocytes apparently secondary to the presence of periodontal disease, since arrest or cure of these pathological processes in individual cases resulted in the elevation of the erythrocyte count to normal or high normal levels. Chronic periodontal disease as a possible contributing factor or cause of mild anemia was also indicated. Recently, various studies have tried to evaluate the relation between periodontitis and anemia. These studies present conflicting results. Hutter  and Thomas  showed that periodontitis patients have a lower hematocrit, lower numbers of erythrocytes, lower hemoglobin levels and higher erythrocyte sedimentation rates. Whereas, the studies by Wakai  and Havemose-poulsen A  failed to show any association between hemoglobin levels and periodontal status. A ten week intervention study. 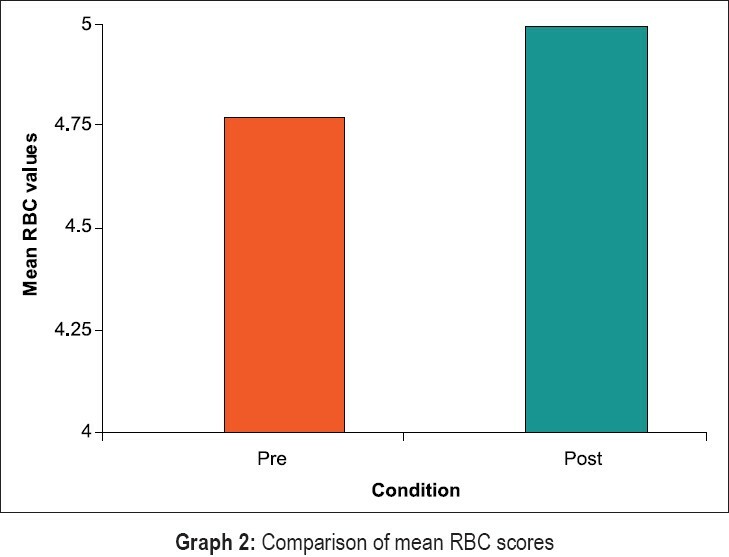 found an increase after scaling and root planing (SRP) in hemoglobin and RBC levels in patients with severe periodontitis. A statistically significant (p less than 0.05) increase from the mean hemoglobin level of 14.5 mg/dl at baseline to 15 mg/dl at 10 weeks after SRP was seen. The change in hemoglobin and RBC values in our study is statistically highly significant but not as high as observed in anemia due to other inflammatory conditions like rheumatoid arthritis  and multiple myeloma. This might be due to the reason that the other diseases are more severe inflammatory conditions than periodontitis. So anemia resulting from periodontitis is relatively mild. This also might be the reason why few studies  failed to find any relation between hematocrit indices and periodontal status. The present study establishes that periodontitis leads to a mild anemia with a decrease in Hb and RBC values. Proinflammatory cytokines such as TNF-a, IL-1β , INF-¡ and PGE 2 are found in high concentrations in inflamed periodontal tissues. The various cytokines can enter the blood circulation and affect distant sites and organs. The same inflammatory cytokines have been found to be central in the pathogenesis of ACD. , So, it can be concluded that periodontitis, like other chronic inflammatory conditions, leads to ACD. Hemoglobin value, erythrocyte count, MCV, MCHC and MCHC levels showed a significant improvement after periodontal treatment. As there was no other diet modification or prescribed supplements, the improved hematological values indicated that periodontitis should be considered as one of the conditions causing anemia of chronic disease. The improvement observed in mean hemoglobin levels after therapy in chronic generalized periodontitis patients was 0.9533 mg/ dl. It implied that periodontitis leads to significant but not severe decrease in hemoglobin values. Thus, ACD resulting from periodontitis should not be expected to be severe. However this study had a drawback of limited sample size. Further, a relation between severity of periodontitis and anemia was not explored in the present study. Further studies with larger sample size are warranted. Newman M, Takei H, Klokkevold P, Carranza F. Clinical Periodontology. 10 th ed. W.B. Saunders; 2006. Hutter JW, van der Velden U, Huffels RAM, Hoek FJ, Loos BG. Lower numbers of erythrocytes and lower levels of hemoglobin in periodontitis patients compared to control subjects. J Clin Periodontol 2001;28:930-6. Wakai K, Kawamura T, Umemura O, Hara Y, Machida J, Anno T, et al . Associations of medical status and physical fitness with periodontal disease. J Clin Periodontol 1999;26:664-72. Merchant A. Whether periodontitis cause anemia cannot be determined. J Evid Base Dent Pract 2002;2:239-40. Thomas B, Ramesh A, Ritesh K. Relationship between periodontitis and erythrocyte count. JISP 2006;10:288-91. Greer J, Rodgers G, Joersfer J, Paraskevas F, Luken J, Glader B. Wintrobe′s clinical haematology. 11 th ed. Lippincott Williams and Wilkins; 2004. Weiss G, Goodnough LT. Anemia of chronic disease. N Engl J Med 2005;352:1011-23. Siegel EH. Total erythrocyte, leucocyte and differential white cell counts of blood in chronic periodontal disease. J Dent Res 1945;24:270-1. Havemose-Poulsen A, Westergaard J, Stoltze K, Skjødt H, Danneskiold-samsøe B, Locht H, et al . Periodontal and hematological characteristics associated with aggressive periodontitis, juvenile idiopathic arthritis, and rheumatoid arthritis. J Periodontal 2006;77:280-8. Rai B, Kharb S. Effect of Scaling and Root Planning in Periodontitis on Peripheral Blood. The Internet Journal of Dental Science. 2008; 6(1). Available from: http://www.ispub.com/ostia/index.php?xmlFilePath=journals/ijds/archives.xml. [last cited on 2007]. Harsh Mohan. Textbook of Pathology 5 th ed. Jaypee brothers Medical Publishers (P) ltd; 2005. Kelly WN, Harris ED Jr, Ruddy S, Sledge CB. Textbook of Rheumatology 5th ed. Philadelphia: WB Saunders; 1997. Steensma D. Prospects and perils of retrospective risk assessment of erythropoiesis-stimulating agents. Am J Hematol 2008;83:693-4. 2 Anemia of Chronic Disease and Chronic Periodontitis: Does Periodontal Therapy Have an Effect on Anemic Status?